Review: Viewsonic Pro7827HD Home Theater $499! 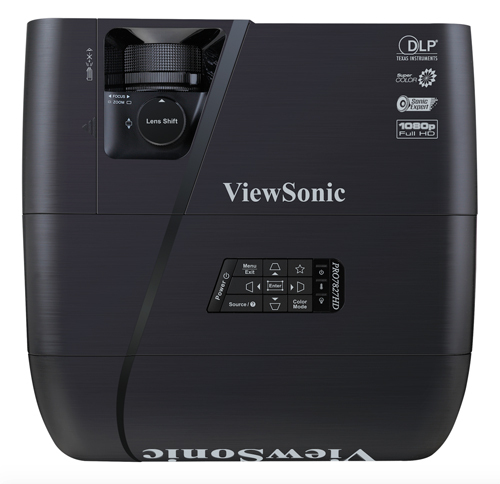 Home / Projector Reviews > Review: Viewsonic Pro7827HD Home Theater $499! This is an update to the ViewSonic Pro7827HD review we originally posted in 2016. 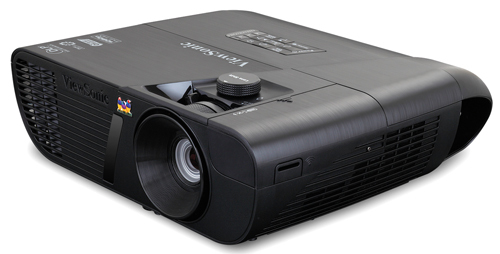 Newly added is a re-evaluation based on the current, lower price as well as on side-by-side testing and feature comparisons to the other sub-$700 projectors in this roundup. The ViewSonic Pro7827HD was unquestionably impressive when we reviewed it at its original price of $889 and is even more so now, at just $499. Along with 1080p resolution, full 3D support, excellent color accuracy, and the best contrast in this sub-$700 home theater roundup, the Pro7827HD offers conveniences that include a 1.3x zoom, three HDMI ports, and a modest vertical lens shift with an easy-to-use control. All the other models in this group cost more, all have only two HDMI ports, none offers lens shift, and except for the ViewSonic PJD7828HDL, all have 1.2x or 1.1x zoom. In addition to boasting more features and the lowest price in the group, the Pro7827HD is one of our top picks in the roundup for traditional home theater, for a TV substitute, and for bringing to different locations, including your backyard for a movie or big game. Its can also do a credible job with 3D. Serious gamers will shy away from it because of its 50 ms input lag--compared with 16 ms for most other models in this group--but it can serve for casual game play. The Pro7827HD is also a lot brighter compared with the rest of the models this roundup than the specs would have you believe. It is tied for the lowest rated brightness in the group, at 2,200 ANSI lumens. But unlike most, it measures very close to its rating--at 99%. The brightest mode also offers far more accurate--or, more precisely, less inaccurate--color than the brightest modes for most of the competition, with only a slight to moderate green bias. So in real world use, you may well be willing to use the brightest mode for the Pro7827HD in situations where you'd stay with the second brightest modes for most of the other projectors. If so, you'll wind up with an image that's as bright as or brighter than every projector in this group except the Epson HC 1060 and ViewSonic PJD7828HDL. Comparing brightness of all of our eight models in this roundup when they are set to their best video quality, the Pro7827HD it is the second brightest in the group, behind only the Epson HC 1060, and bright enough to light up a 200" 1.3 gain screen in a dark room or a 125" screen with moderate ambient light. That is a lot of light. RGBRGB color wheel delivers high quality color, in large part because there's no white panel to boost white brightness far above color brightness. Low Lamp Mode. Eco mode reduces brightness by about 35% compared with normal mode. There are two other Eco lamp settings as well. Dynamic mode works much like an auto iris, making dark scenes darker. However it changes brightness by lowering lamp power, which both conserves energy and lengthens lamp life. SuperEco mode lowers brightness to roughly 15% to 18% of Normal mode with any given preset and is meant as an automated power-saving feature, even though you can set it manually as well. If you enable the Smart Energy Power Saving option, the projector will automatically switch from Normal to Eco mode after 5 minutes without input and to SuperEco mode after 20 minutes. Video Optimized Lumens. The Pro7827HD's Standard color mode comes close to matching a reference projector straight out of the box. It also delivers the best contrast and sense of three dimensionality of any projector in this roundup, and typically good black level and shadow detail for the DLP models in the roundup. The measured 1,450 ANSI lumens is enough with a 1.0 gain screen for up to a 175" diagonal 16:9 image in a dark room or a 110" image in a room with moderate ambient light. A 1.3 gain screen bumps the sizes to as much as 200" in a dark room and 125" with ambient light. Video Performance. As the names imply, the ViewMatch sRGB mode is designed to match the sRGB standard while the Movie (Rec. 709) mode is designed to do the same for the Rec. 709 standard for HDTVs. And, indeed, both, deliver color with default settings that's well within the range of realistic--although you can easily see the difference in color between either one and Standard mode with its better color accuracy if you switch between them. Dynamic mode is a touch oversaturated. However, it is within a range that many people actually prefer to more realistic color, making it more than acceptable if you need the higher brightness. Brightest mode has a slight green tint, which is easy to see if you switch to it from any other mode. However, it's also slight enough that you probably won't mind using it on an occasional basis, like on a bright day in family room. Like Dynamic mode, it is a little oversaturated, but you can tone that down in either mode with the Saturation setting. You can also adjust Hue to minimize the green bias. Zoom Lens Effect. In the full telephoto setting, the 1.3x zoom drops the brightness by about 9 percent, which is little enough to be barely noticeable. It is not enough to worry about when positioning the projector unless you are trying to get the largest usable image possible for the ambient light level. Brightness uniformity. The measured 58% brightness uniformity is low for home theater projectors in general, but at the high end of typical for the models in this sub-$700 roundup. Six of the eight projectors in this group have 60% or lower uniformity measurements. More important is that a uniformity measurement in this range doesn't necessarily translate to a problem in real world use. For that, the brightness also has to vary significantly enough over a short distance so you can see obvious hot spots or dim areas. Neither is true of the Pro7827HD. On-board audio. The 10-watt mono speaker delivers highly usable, if slightly tinny, sound quality and high enough volume to fill a large room. Fan noise. Compared with other projectors in this roundup, the Pro7827HD's fan noise is solidly typical. In both full power and Eco modes, its on a par with at least half of the other projectors in the group. With full power mode, you can hear it during quiet moments in a film. In Eco mode it is low enough so few would notice it in a room with ambient noise, but you might notice it a quiet traditional home theater. With High Altitude mode, it is loud enough in both Bright and Eco modes to be intrusive in quiet moments, even in a room with ambient noise. Input lag. The roughly 50 ms input lag ranks second slowest in this roundup. Casual gamers should find it acceptable, but if you're serious about games where reaction time matters, you'll want one of the five projectors in the group with a 16 to 17 ms lag. Most of the ports are on the back panel. However, the HDMI/MHL-3 port is in a compartment on the left side as viewed from the back and hidden by a cover held on with a screw. The port is meant primarily for a wireless dongle and is paired in the compartment with a captured cable ending in a micro USB connector to power dongles that need it. If you want to use the port for a third external video source, the cover includes a punch-out piece of plastic you can break off to let you run a cable through the hole and over the top or side of the projector. Throw Distance. The ViewSonic Pro7827HD's throw distance for a 120" 16:9 image ranges from about 9.6 feet at its widest-angle setting, for maximum brightness, to about 13 feet at its full telephoto setting with a 9% drop in brightness. You can find the throw distance range for the image size you want by using the ViewSonic Pro7827HD Projection Calculator. Lens offset. With the projector sitting on a table and the lens shift in its lowest vertical position, we measured the bottom of the image at 6% of the image height above the midline of the lens. With the vertical lens shift at the highest level, the offset was a bit more than 16%. The offset will work nicely with the projector on a table or low shelf or inverted in a ceiling mount. Placing the projector on a higher shelf behind the seats will usually require you to tilt it downward to hit the screen, then use keystone adjustments to square off the image. This is best avoided, since the keystone adjustment reduces lumen output and can add artifacts to fine patterns as well as soften edges in the image. The ViewSonic Pro7827HD is one of the more impressive choices in this eight-projector roundup. It delivers excellent color accuracy, the best contrast for any projector in the roundup, support for ISF-Certified color calibration, and conveniences that include a 1.3x zoom, three HDMI ports, and a vertical lens shift. The Pro7827HD also fits well with a wide range of applications. Rated at 2,200 lumens, it can throw a suitably large image that can stand up to ambient light in a living room, but its Eco mode and lower brightness presets offer comfortable brightness levels for theater-dark lighting as well. At just 5.7 pounds, it's light enough for portable use too. The brightness rating is accurate, but also misleadingly low when you compare it with ratings from other projectors in this group. The Pro7827HD actually measures at 99% of its rating, rather than the 75% to 85% for most of the others. Also unlike most of them, it still measures well over 50% of its rating with video optimized settings, at 1,450 ANSI lumens. Only the Epson HC 1060 is brighter with video optimized settings, and the Pro7827HD blows the HC 1060 away for contrast, black level, and shadow detail. Next brightest is the BenQ 1070A at 1,070 lumens. With video optimized settings and a 1.3 gain screen, the Pro7827HD can give you up to a 200" diagonal image in a dark room or 125" image with ambient light. If you need even higher brightness, it can provide that too. Its brightest mode with color that's in a realistic range is equal to or brighter than the equivalent brightest-with-good-color-mode (for lack of a better name) for five other models in the roundup, four of which have higher ratings. For 3D, the Pro7827HD delivers essentially the same quality as for 2D in most ways. However, the drop in brightness is more obvious than with some of the projectors in this roundup, to roughly half the brightness of the least bright 2D color mode. There's only one 3D color preset, but you can adjust the image settings. The projector also did well on those aspects of image quality that are specific to 3D. I didn't see any crosstalk and saw just a hint of 3D-related motion artifacts in the most demanding clips. Serious gamers will want to avoid the Pro7827HD in favor of one of the models in this roundup with a 16 ms input lag. More casual game players may find the Pro7827HD's 50 ms lag adequate, despite its built-in handicap for games where reaction time matters. The combination of brightness, image quality, light weight, robust built-in audio, and conveniences like the 1.3x zoom and vertical lens shift all help make the ViewSonic Pro7827HD one of our top picks in this roundup for a traditional home theater, a TV substitute, and moving from one location to another, including your backyard for a movie night. If you're getting it for any of those applications, it can also handle 3D well enough so you won't be disappointed by it. And, unless you're a serious gamer, you may consider it suitable for game playing as well. I wish I had read this Monday before I bought the Epson 2150! I appreciate all the budget reviews. Thanks. I just mounted this ViewSonic to my basement ceiling a week ago, then I installed a fix mounted PVC 120" screen with velvet wrapped aluminum frame. The gain is 1:1 and my friends and family are blown away. For under $600 for both the projector and screen, nothing beats it for this price point. I have to say this is my favorite place to hang out now, right in front of this movie theater!